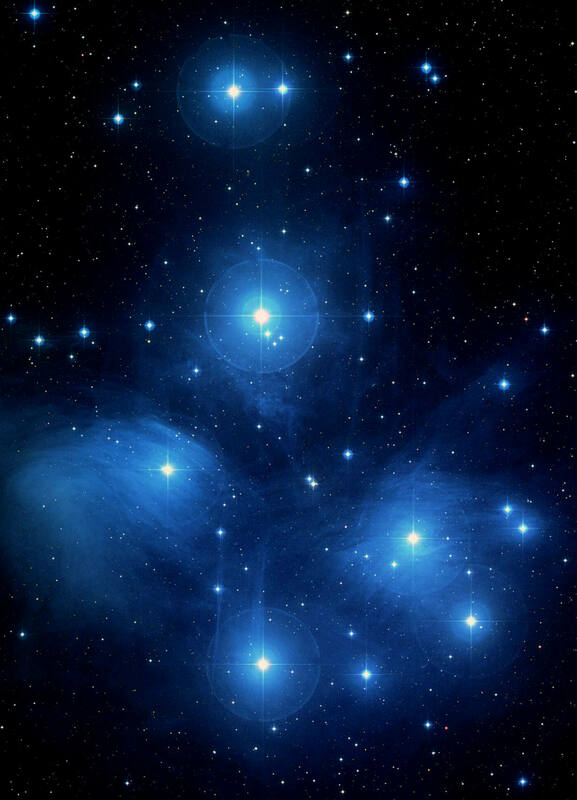 Astronomy can be weird for a girl. You start off buying a telescope and the next thing you know you have lost all sight of that Prada handbag and start focusing ( if you'll pardon the pun) on Astro 'bling'. For me the epitome of this is the Moonlite Crayford focuser. When I bought my 8" SW 200P I originally had the Sky-Watcher supplied Crayford which worked well enough but I am a bit picky if the truth be told and having seen a Moonlite unit at a star party resolved to have one as my Christmas present. The unit I plumped for was the MoonLite CR Dual Rate tri-knob Crayford Focuser The unit was supplied by the estimable Steve at First Light Optics. I'd recommend that if your going to buy one of these you take some advice about what to buy as Moonlite do a bewildering range of options. Mine was ordered up in the all black colour rather than the standard red. There's no charge for colour options and Moonlite do these in a range of colours that would gladden any womans heart. You'll also need a fitting kit to attach it to your choice of telescope. The whole package from my Sky-Watcher 200 cost £275 from First Light Optics and for a time I agonised about how many pairs of shoes I could buy for the same money. 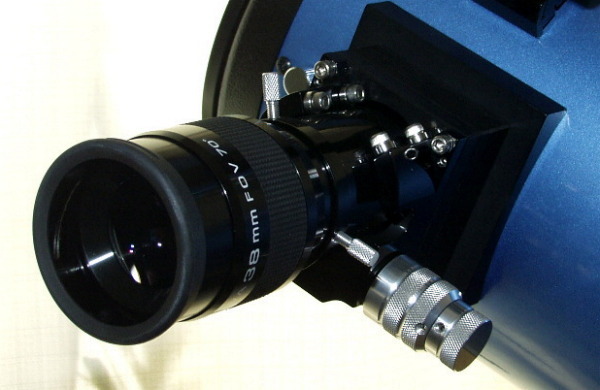 The supplied fitting kit allows the focuser to be mounted at different distances from the telescope tube which will provide imagers with the low profile they need and observers with the higher profile for observing. Drawtubes can be ordered in various lengths at the time of purchase and its one more reason why you should buy this kind of product from a dealer where you will get some advice and help. When I opened up the packaging of my 'present' on Christmas day I found possibly the most beautiful object I could have imagined (well apart from a pair of Jimmy Choos or a Prada handbag). The focuser was frankly astounding in its quality and I marvelled at how Moonlite could turn them out at the price they ask. The machining was perfection and the fit and finish was simply amazing. The black anodising was absolutely flawless and every single part breathed perfection. I cant recall ever seeing something so beautifully well made with every component having the feel of complete quality and put together by someone to whom these are clearly a labour of love. Left - The Moonlite Tri-Knob attached to the Sky-Watcher 200. its a beautiful looking piece of equipment which will add to almost any scope. Fitting the unit to my Sky-Watcher 200 proved nigglesome more than difficult. The Moonlites fittings didn't quite match perfectly to the holes left behind by the Sky-Watcher unit which required me to file two of the holes out to a slightly larger size. The Moonlite comes with its base plate pre-drilled for a range of scopes and it was a bit tricky at first to work out which ones were the right ones for the Sky-Watcher. This was more a case of experimentation more than a real problem and patience as ever paid dividends. Once attached the unit looked great and gives the scope a real touch of class. Performance wise the Moonlite simply cant be faulted. It can pull the heaviest of eyepieces with ease and even its coarse control is far better than some focusers fine controls. The fine control on the Moonlite is smoothness itself. For the first few weeks I couldnt help giving the fine focus a twiddle each time I went past the scope and at Star Parties I have noticed other astronomers cant seem to get past the Moonlite focuser without stopping by to ask if they have have a fiddle with the focusing. One of the great advantages is the units ability to handle almost any eyepiece small or large with no real effect on its 'feel' as you use the unit to focus. The focuser tension can be adjusted using some allen headed bolts under the focuser although I cant imagine many eyepieces would require this, even my 38mm Panaview which is a pretty heft unit at around 1.5lb doesnt require the tension to be adjusted. Above - The Moonlite can haul even large eyepieces like this 1.5lb monster and even the massive ES-1400 at over 2lbs with no effort and no slippage. Something you should take care of is the top rollers on the drawtube. Over time these can become contaminated with general drek and start to score the top of the drawtubes flawless finish. Periodically you should clean the rollers with a soft cotton bud to keep the unit perfect. This is no refelection on the Moonlite and I would suspect most Crayford style focusers are prone to this. The unit has collimation screws to adjust the focusers angle to the tube if required and as an option a focus lock can be supplied. I passed on this as I do only observational astronomy. The tri-knob version has three knurled knobs which control the tension of the compression ring and will hold any eyepiece to a near perfect centre. The unit was supplied with a 2" to 1.25" adapter which like the focuser quietly screams quality at you. It too has a compression ring to give all of your eyepieces the benefit of compression mounting. The drawtube is machined with ridges to neutralise any stray reflections and just enhances the overall quality feel of the product. The quality engineering of the Moonlite focuser really comes to the fore during collimation where, whether using a laser or a Chesire, you will find collimation is more consistent and easier to achieve as the dreaded focuser 'slop' is simply removed from the process. The Moonlite never deviates from perfect centreing as you move the focus. It may look like 'astro bling' but the Moonlite is a superb piece of engineering that will make focusing a dream. No more scope wobble as you can precisely focus with the fine rate knob which is so smooth there's no reason for your telescope to get the jitters. No more wobble as you rotate the fine controls to get sharper focus. Its simply a beautiful piece of equipment and I would consider it the best accessory I have bought in my quest to upgrade the scope. Alexander Pope wrote in his Essay on Criticism "Whoever thinks a faultless piece to see, thinks what never was, nor is, nor ever shall be" But then he didn't own a Moonlite focuser which is simply - poetry. ...I acquired a Skywatcher Skymax 180 Pro Maksutov and one of the the things I found really annoying with this otherwise fine telescope was its image shift caused by the focuser. I resolved to correct this with an external focuser and naturally Moonlite was my first thought. The Moonlite SCT focuser is even nicer than the Newtonian version with big chunky fittings. 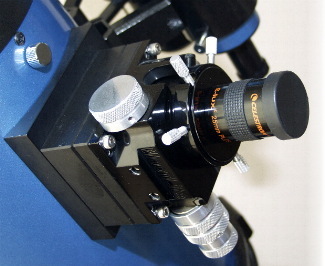 A rotation ring to allow the focuser to rotate around which works beauatifully with almost zero image shift and the shaft lock feature which securely locks the focuser. This is more for imaging than a visual observer but I thought it a feature worth having. The result is below. A really wonderful piece of craftsmanship which works as good as it looks. It even matched my nails !